Today we are talking Beets. I know that they don’t look enticing or they might not be fun to cook with or even that great tasting for most people. But let me tell you that this is a fabulous super food and you should try to incorporate it into your diet. Beets belong to the same family as spinach and chard. It’s a rich purple color, but can also be white or golden. Think of beets as red spinach. 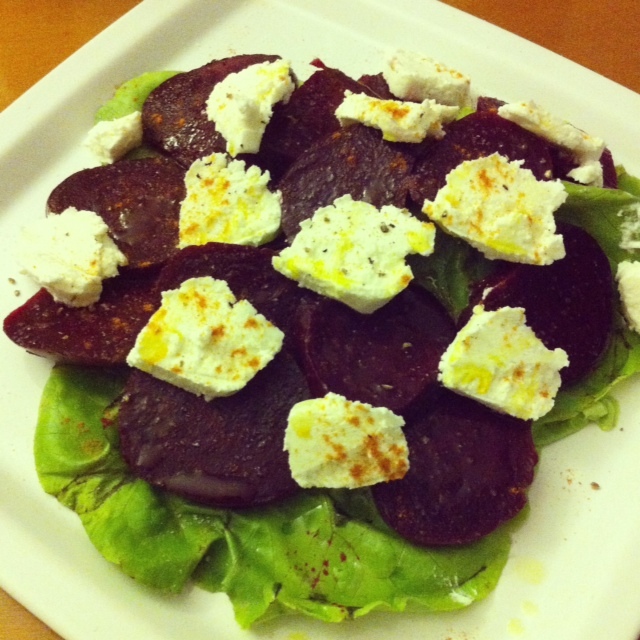 Beetroot is of exceptional nutritional value mainly Vitamin C, Folate & Betaine. All of which are exceptional for the human body. From lowering blood levels & helping with cardiovascuar health, to immune boosting & liver detoxification, as well as cancer fighting benefits and of course high in antioxidants. You should really try them. You can eat them raw, pickled but mainly they are eaten steamed. Here is a quick recipe that packs a bunch of flavor and will keep you coming back for more of this little overlooked vegetable. Wash your lettuce and place 2 on each plate. Slice your beets and lay them on top of the lettuce. Slice your cheese and place on top of the beets. Drizzle 1 tbsp of Extra Virgin Olive oil, sprinkle remaining ingredients and enjoy!